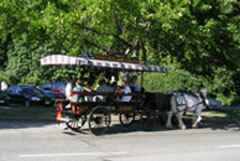 Stanley Park offers a variety of activities for young and old. 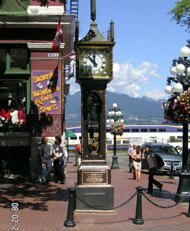 When Lord Stanley officially opened Vancouver’s Stanley Park in 1889, the Governor General of Canada (for whom the park was named) dubbed it a “place for the use and enjoyment of people of all colours, creeds, and customs for all time.” Lord Stanley would be pleased. 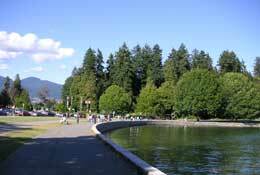 Today, the park remains a place for nature lovers, joggers, cyclists, and families who live, work, or are visiting Vancouver. A true year-round attraction that welcomes thousands upon thousands of visitors each year, 1,000 acre (400 hectares) Stanley Park is one of Vancouver’s most visited sites. 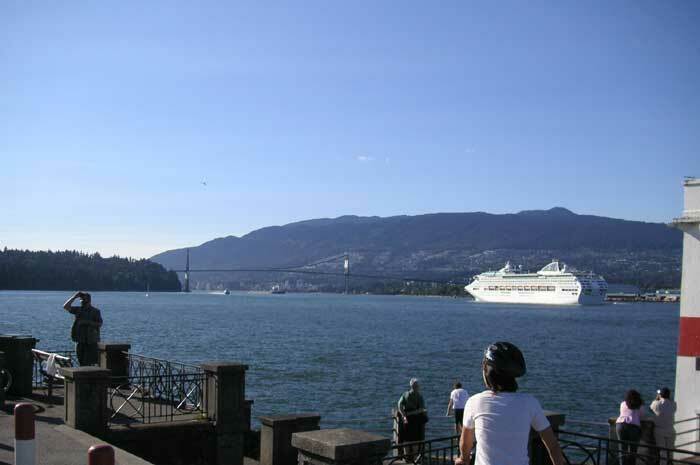 Surrounded by water, nestled between the Burrard Inlet and English Bay, this 100+ year old park is easy to reach from the downtown area and is the ideal location for enjoying rest, relaxation, and a bit of exercise. Every inch of this park is full of exciting and educational activities. For visitors, a sensible first stop might be the recently-built Brockton Visitor Centre, where guests can gather basic information about the park, pick up a map, grab a snack or souvenir, and use the restrooms. 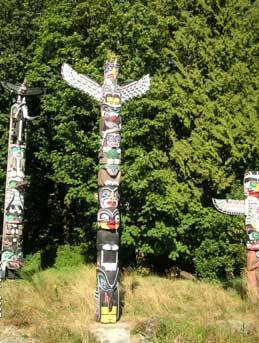 The most popular attraction around the visitor center, however, is the 8 totem poles that have long stood in the park. 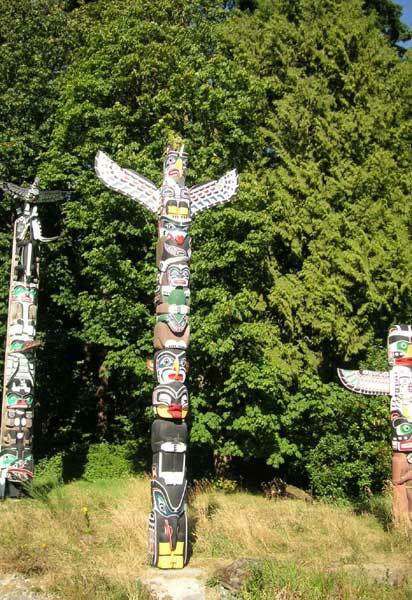 These fascinating works of art are among the most-photographed totem poles in North American and were designed by native Canadians from the Haida, Nuu-chah-nulth, Nishga, and North and South Kwakiutl tribes. 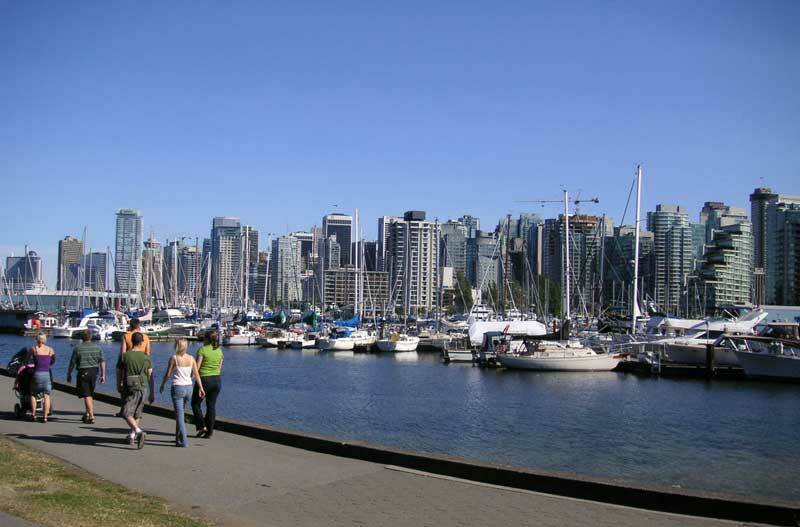 The 10.5 kilometer (6.5 mile) Seawall that circles the park is also a popular place for park visitors. 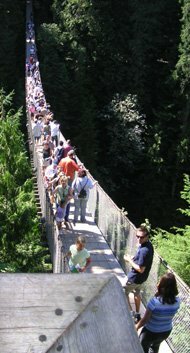 You can walk, jog, bike, or skate along this wall, designed to slow erosion but now one of the busiest sections of the park. 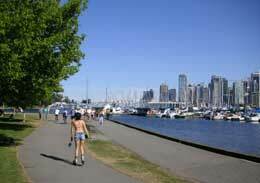 Under construction for six decades, the seawall now boasts two paths, one for skaters and cyclists and the other for pedestrians. 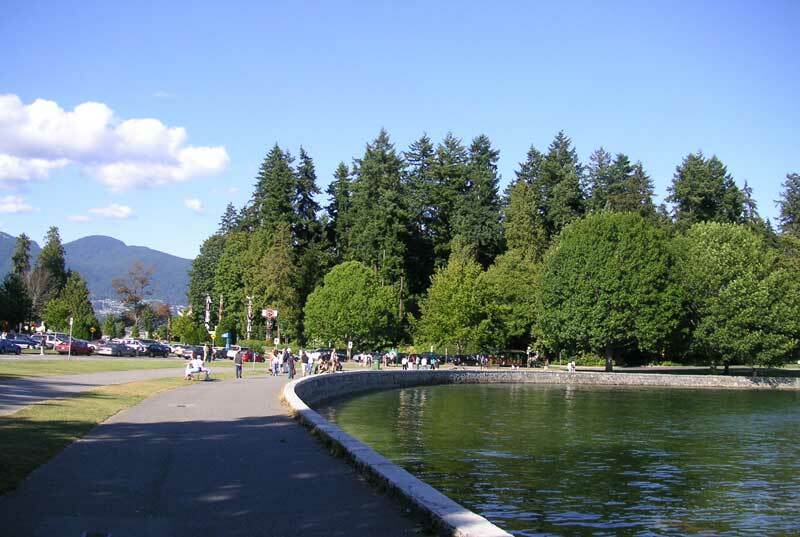 Families are especially fond of Stanley Park. The fascinating Vancouver Aquarium attracts tons of young visitors each year, who stop by to view the huge tanks full of cool fish as well as the live shows that showcase the aquarium’s most famous residents…the otters, seals, sea lions, and whales. The kids will also beg you to visit the children’s farmyard, where they can interact with a barnyard full of domesticated animals as well as birds and reptiles. 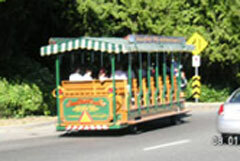 You’ll also want to make a stop at the miniature railway, which becomes a fun Haunted Train during the Halloween season. Other active pursuits include three public lifeguard-protected beaches, more than a dozen tennis courts, and an 18-hole 3-par pitch and putt golf course. Of course, no park is complete without flower gardens! 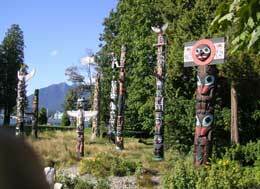 At Vancouver’s Stanley Park, you’ll find some of the most dazzling gardens in Canada, with spring being an especially good time to visit them and see the flowers in full bloom. Check out the Ted and Mary Greig Rhododendron Garden, the formal Rose Garden, and many additional small flowering areas scattered throughout the park, all lovingly grown and maintained by the Park Board. Don’t miss the Nature House, an interactive interpretive and ecology center, where visitors will be treated to lessons about the variety of flora and fauna that are a part of Stanley Park’s natural habitat. Stop at Lost Lagoon as well, for a look at the many species of birds that live near this freshwater pond. If your goal is to see the entire park in just a day or less, be sure to bring your car. 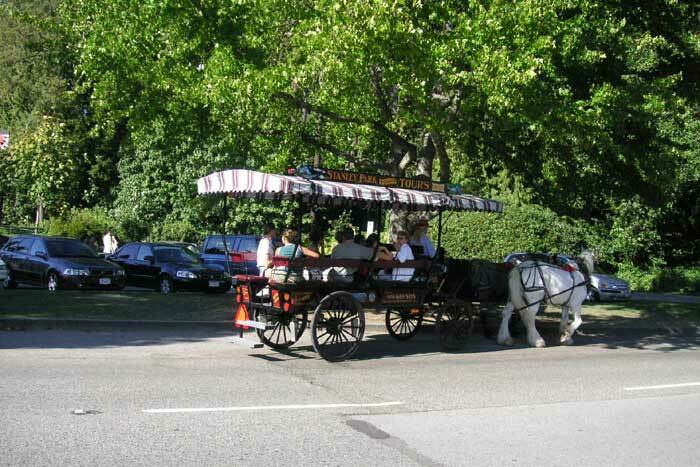 That doesn’t mean, of course, that you can’t get out and walk, bike, or job on the park’s many pristine forested trails or enjoy a picnic lunch in the shade. 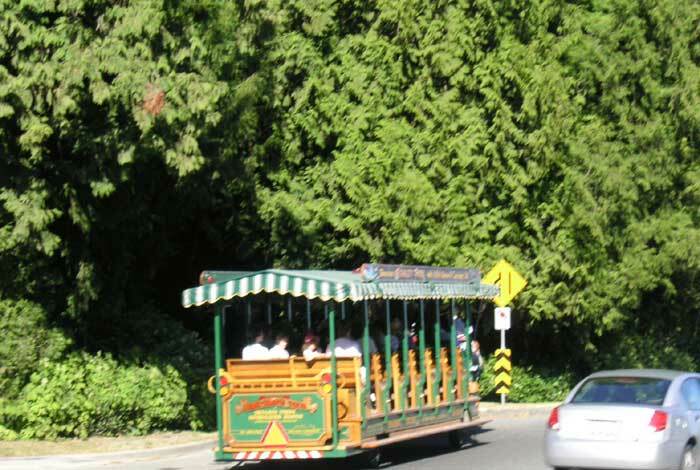 Vancouver’s Stanley Park is also a stop on most trolley and bus tours, so you’ll be able to disembark and stay as long as you’d like. Stanley Park is within walking distance of many fine hotels. For a good choice of hotels with discount prices, visit Where to Stay in Vancouver for more information. Copyright ©2005-20012 Abbey World Media, Inc.